This article is about the area of London. For other uses, see Shadwell (disambiguation). In the 13th century, the area was known as Scadflet and Shatfliet – derived from the Anglo-Saxon fleot, meaning a shallow creek or bay – the land was a low lying marsh. A spring, issuing from near the south wall of the churchyard was dedicated to St Chad, and filled a nearby well. The origin of the name is therefore confused, being associated with both the earlier use and the later well. Shadwell was formerly called Chadwelle. 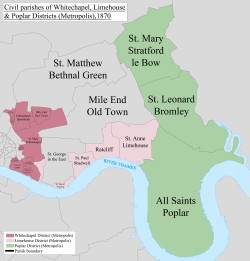 A map showing the Shadwell ward of Stepney Metropolitan Borough as it appeared in 1916. Shadwell Waterworks was sold in 1801 to the London Dock Company; the waterworks were the first ones in London to use a Watt steam engine in 1788. The waterworks were later sold to the East London Waterwork Company for £300,000 in 1808, after an Act of Parliament allowed the company to obtain a compulsory purchase order. The modern area is dominated by the enclosed former dock, Shadwell Basin, whose construction destroyed much of the earlier settlement – by this time degenerated into slums. The basin once formed the eastern entrance to the then London Docks, with a channel leading west to St Katharine Docks. It is actually two dock basins - the south basin was constructed in 1828-32 and the north basin in 1854-8. A new entrance to Shadwell dock was opened in 1832, giving Shadwell access to the River Thames. :119 Between 1854 and 1858, a 45 feet wide new entrance to the docks was constructed to allow larger ships into the dock. Shadwell Basin was one of three locked basins connecting the docks to the River Thames, and is the only one of the three still in existence today. In 1865, HMS Amazon docked at Shadwell Basin in order to pick up around 800 Mormons who were emigrating to America,:130 and in 1869, the Blue Jacket clipper, then the fastest clipper in the world, began her journey to Canterbury, New Zealand in Shadwell Basin. In 1865 during excavation for the creations of some docks at Shadwell, four nearby houses were flooded. In 1844, Shadwell was recorded as having had a population of 10,060, and having ten almshouses built using money from James Cook. Watney Market developed into a busy shopping area around this time. In the 19th century, Shadwell was home to a large community of foreign South Asian lascar seamen, brought over from British India by the East India Company. There were also Anglo-Indians, from intermarriage and cohabitation between lascar seamen and local girls. There were also smaller communities of Chinese and Greek seamen, who also intermarried and cohabited with locals. In 1805, lascars caused disturbances in the streets of Shadwell which ended with 15 people being hospitalised, and 19 people being arrested. In 1906, the Corporation of London agreed to contribute £500 to the widening of Shadwell High Street to 40 feet (12 m). In 1916, seven women were killed in a sack factory fire; around 50 women were in the building at the time, and the rest escaped. The five-storey warehouse was almost completely destroyed. In 1934, a 10 lb (4.5 kg) bomb was found four feet below the surface of Shadwell High Street; the bomb was believed to be from the German World War I air raids on the area. In 1936, residents of Shadwell were involved in the Battle of Cable Street, in which Oswald Mosley's attempted fascist march from Tower Hill to Aldgate via Shadwell (which was predominantly Jewish) was stopped by 250,000 protestors blocking their path by overturning a lorry. In 1982, a mural was created to commemorate the moment, and was restored in 2011. Workers in Shadwell had previously opposed the British Union of Fascists, and in 1937, Shadwell dockers threatened an unofficial strike after local casual dock labourer Cecil Anthony Hiron was nominated as a BUF candidate in the Stepney Council elections in November; Hiron later withdrew his nomination. The Watney Market area was demolished and rebuilt during the 1970s and 1980s. In 1987, Shadwell DLR station was opened, which connected Shadwell to Tower Gateway near Fenchurch Street, and later also Bank station from 1991. St. Paul's Shadwell with St. James Ratcliffe, is traditionally known as the Church of Sea Captains. In 1656 the church was established as a Chapel of Ease, from St Dunstan's, at Stepney. In 1669, it was rebuilt as the Parish Church of Shadwell, and it was the last of five parish churches rebuilt after the Restoration. In 1820, it was again rebuilt as a 'Waterloo church'. Captain James Cook was an active parishioner and John Wesley preached in the church from time to time. Isham Randolph of Dungeness, one of Thomas Jefferson's grandfathers and son of William Randolph, was married in St. Paul's church. Every four years, residents of Wapping ward elect two councillors to represent them on Tower Hamlets Council. In 2014, residents elected two Tower Hamlets First councillors. In 2018, they elected one Liberal Democrat councillor and one Labour councillor. According to the 2011 census, 15,110 people lived in Shadwell. 52.9% of people were born in the United Kingdom, with the next highest being 20.8% of people being born in Bangladesh. The most common religion in Shadwell is Islam, with 46.7% of people identifying as Muslim, the next highest being 23.7% who identified as Christian. Sir William Henry Perkin (12 March 1838 - 14 July 1907), was born in Shadwell and at the age of 18 discovered the first aniline dye while doing experiments at his home in Cable Street. For details of education in Shadwell, see List of schools in Tower Hamlets. The nearest London Overground stations are Shadwell and Wapping and the Docklands Light Railway stations at Limehouse and Shadwell. In 2006 local Housing Association, Tower Hamlets Community Housing (THCH) built a new block of flats in Shadwell, adjacent to the existing flats at the corner of Cable Street and Devonport Street, called Thirza House. It was opened by Mildred Gordon, a former Shadwell resident and MP for the area from 1987 to 1997. As part of the new development THCH built a hop garden. Since 2007, THCH have held a Hop Festival every September in the hop garden to commemorate the tradition of generations of East Enders temporarily migrating to Kent's hop gardens to harvest the hops. THCH have produced souvenir booklets containing historical photos of East Enders harvesting hops which are available from Tower Hamlets Community Housing. In 2009 the Shadwell hops were harvested by the local residents and Brodies Brewery in Leyton used them to create a new beer called "Old Hopper's Brew". The beer sold out within a month. ^ Shadwell & St. George's East railway station had opened in 1840, and Shadwell railway station in 1876. ^ "Tower Hamlets Ward population 2011". Neighbourhood Statistics. Office for National Statistics. Retrieved 17 October 2016. ^ a b c d e Cox, Jane (November 2013). Old East Enders: A History of Tower Hamlets. The History Press. Retrieved 21 January 2016. ^ Sheppard, Francis (November 1988). London: A History. OUP Oxford. p. 40. Retrieved 21 January 2016. ^ a b Hughson, David (1805). London; Being an Accurate History and Description of the British Metropolis and Its Neighbourhood: To Thirty Miles Extent, from an Actual Perambulation, Volume 4. Retrieved 22 January 2016. ^ a b Clark, Peter (2000). The Cambridge Urban History of Britain, Volume 2. Cambridge University Press. pp. 297, 319. Retrieved 21 January 2016. ^ a b Bucholz, Robert O.; Ward, Joseph P. (July 2012). London: A Social and Cultural History, 1550–1750. Cambridge University Press. Retrieved 22 January 2016. ^ a b Porter, Roy (October 2000). London: A Social History. Penguin. Retrieved 21 January 2016. ^ a b Merritt, J.F. (2001). Imagining Early Modern London: Perceptions and Portrayals of the City from Stow to Strype, 1596-1720. Cambridge University Press. Retrieved 22 January 2016. ^ a b Richardson, John (July 2001). The Annals of London: A Year-by-year Record of a Thousand Years of History. W&N. Retrieved 22 January 2016. ^ Linebaugh, Peter (March 2006). The London Hanged: Crime and Civil Society in the Eighteenth Century. Verso. p. 321. Retrieved 22 January 2016. ^ Wheatley, Henry Benjamin; Cunningham, Peter (January 2010). London Past and Present: Its History, Associations, and Traditions. Nabu Press. p. 334. Retrieved 21 January 2016. ^ Brayley, Edward Norris; Brewer, James Norris; Nightingale, Joseph (1810). London and Middlesex, or, An historical, commercial, & descriptive survey of the metropolis of Great-Britain. Retrieved 22 January 2016. ^ Cassis, Youssef; De Luca, Giuseppe; Florio, Massimo (January 2016). Infrastructure Finance in Europe: Insights into the History of Water, Transport, and Telecommunications. OUP Oxford. Retrieved 21 January 2016. ^ a b c d e Gilbert, Rodney (June 2014). Gold Letters Limp B&W. Rod Gilbert. p. 122. Retrieved 22 January 2016. ^ a b Werner, Alex; Williams, Tony (April 2012). Dickens's Victorian London, 1839-1901. Ebury Press. Retrieved 22 January 2016. ^ "London Dock" (PDF). Berkeley Group. Retrieved 22 January 2016. ^ Lewis, Samuel (1848). A Topographical Dictionary of England. pp. 51–56. Retrieved 30 May 2016 – via British History Online. ^ Behal, Rana P.; van der Linden, Marcel (January 2007). Coolies, Capital and Colonialism: Studies in Indian Labour History. Cambridge University Press. p. 42. Retrieved 21 January 2016. ^ Glinert, Ed (June 2007). Literary London: A Street by Street Exploration of the Capital's Literary Heritage. Penguin. Retrieved 22 January 2016. ^ Grady, Standish Grove (1862). The diminution of the poor rate by improved legislation. pp. 80–81. Retrieved 22 January 2016. ^ a b The Cultural Construction of London's East End: Urban Iconography, Modernity and the Spatialisation of Englishness. Rodopi. August 2008. Retrieved 22 January 2016. ^ a b Hibbert, Christopher; Weinreb, Ben; Keay, Julia; Keay, John (April 2010). The London Encyclopaedia. Macmillan. Retrieved 21 January 2016. ^ Jackson, Sarah; Taylor, Rosemary (July 2014). Voices from History: East London Suffragettes. The History Press. Retrieved 21 January 2016. ^ "The Battle of Cable Street". ^ "Cable Street: 'Solidarity stopped Mosley's fascists'". BBC News. ^ Linehan, Thomas P. (December 1996). East London for Mosley: British Union of Fascists. Routledge. pp. 88–89. Retrieved 21 January 2016. ^ Edwards, Brian C. (December 1992). London Docklands: Urban Design in an Age of Deregulation. Butterworth-Heinemann. p. 18. Retrieved 22 January 2016. ^ Gayler, Hugh J. (1996). Geographical Excursions in London. University Press of America. p. 133. Retrieved 22 January 2016. ^ Seiler, Robert M. (1970). The Book Beautiful: Walter Pater and the House of Macmillan. Continuum International Publishing Group Ltd. p. 1. Retrieved 22 January 2016. ^ Jah Wobble, Memoirs of a Geezer, p. 161-2. Wikimedia Commons has media related to Shadwell, London. Wapping is a district in East London, England, in the London Borough of Tower Hamlets and uniquely has it own postcode area E1W, which covers the entire neighbourhood. It is situated between the north bank of the River Thames and the ancient thoroughfare simply called The Highway. Wapping's proximity to the river has given it a strong maritime character, which it retains through its riverside public houses and steps, such as the Prospect of Whitby and Wapping Stairs. It also has a Royal Navy shore establishment base on the riverfront called HMS President. Cannon Street station, also known as London Cannon Street, is a central London railway terminus and connected London Underground station in Travelcard zone 1 located on Cannon Street in the City of London and managed by Network Rail. It is one of two London termini of the South Eastern main line, the other being Charing Cross, while the Underground station is on the Circle and District lines, between Monument and Mansion House. The station runs services by Southeastern, mostly catering for commuters in southeast London and Kent, with occasional services further into the latter. The Metropolitan Borough of Stepney was a Metropolitan borough in the County of London created in 1900. In 1965 it became part of the London Borough of Tower Hamlets. Hereford was, until 2010, a constituency of the House of Commons of the Parliament of the United Kingdom. Since 1918, it had elected one Member of Parliament (MP) by the first-past-the-post voting system. Judah Bergman, known as Jack Kid Berg or Jackie Kid Berg, was an English boxer born in the East End of London, who became the World Light Welterweight Champion in 1930. Watson Fothergill was an English architect who designed over 100 unique buildings in Nottingham in the East Midlands of England, his influences were mainly from the Gothic Revival and Old English vernacular architecture styles.